Transcendence is being built by the people behind Maoneng, whose team has joint experience of delivering over 50 billion dollars worth of infrastructure projects globally. Maoneng is an experienced and leading developer in renewables, currently constructing the largest solar power plant in the Southern Hemisphere. A company is only as good as its people. The hard part is actually building the team that will embody the vision and propel you foward. We've started the process, and improving on it everyday. Qiao has over 10 years experience across planning, development, engineering, contracting, construction, financing and sales of renewable energy and civil infrastructure assets. Milton has over 10 years experience being involved in the global Solar PV value chain and Fintech Payment sectors by bridging China and Australia, transforming numerous startups, by bringing them from zero to success. Kevin comes from an investment banking background, having been involved in or led infrastructure transactions exceeding $40 billion in enterprise value, across the Infrastructure, Utilities and Renewables and Resources sectors. Steve has extensive experience designing and delivering complex systems across the globe for millions of users. He has helped a wide range of companies develop digital solutions, with a strong focus on design, delivery, stakeholder engagement and management. Alex has 12 years’ experience conceptualising and executing end-to-end digital marketing strategies for top-level startups around the world and has been involved in the blockchain and crypto space for over 3 years. Antonia comes from a legal background, having worked at top tier law firms. She has extensive experience working on major infrastructure projects globally. She also has experience advising on blockchain and cryptocurrency since 2015. Chris has 10 years’ experience in driving user strategy and delivery within startups, telecommunications, enterprise and the financial space, and is a crypto enthusiast amongst other emerging technologies. Thomas has 6 years UX, UI and Visual Design experience that enables him to connect brands and companies with their customers through good design. Isabelle has over 7 years communications experience, with a background in the tech sector. She has worked internationally in New York, Dublin and Sydney for companies such as Microsoft and Foursquare. Yolanda’s was the youngest ever cabin purser while receiving numerous prestigious awards from CAAC during her tenure with Shanghai Airlines. Currently has worked on transactions with over $200+ million in enterprise value. Michael has more than 8 years of experience in systems design, project and resource management, testing and commissioning, operations, FMECA, O&M and RAMS. Michael brings with him years of experience leading teams through changing business environment. With the most relevant industry advisors, less time is wasted on figuring out what could work, more time working on delivering what will work. Ivan is an experienced startup and corporate advisor with over 18 years’ experience, including investment banking at ABN Amro Australia, and corporate strategy and M&A at Fairfax Media. Ivan holds a BSC in Pharmacology UNSW and MBus UTS. Vaibhav’s a veteran software developer with an extensive background in building decentralised apps with scalable and safe smart contract protocols. He’s on the advisory board for several well reputed multi-million ICOs. Paul is the Co-Founder of Entersoft, a global award- winning Cyber Security organisation. Entersoft team has helped launch and secure ICOs worth over $1 billion all over the world. Winner of multiple awards including Hong Kong Fintech of the Year. With close to two decades of senior public policy experience in renewable energy and sustainability policy and projects, Simon is one of Australia’s leading renewable energy advocates. We understand the difficulties and pain points of the industry. Our team has joint experience in delivering over $50 billion worth of projects globally. 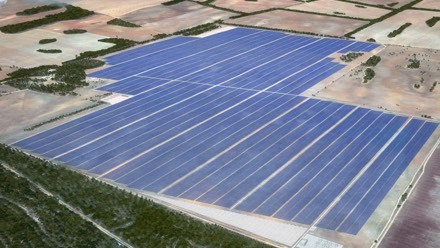 Our holding company, Maoneng Group, is currently building Sunraysia Solar Farm - 255MWp, the largest to be built in Australia. First Major project, developed, owned and operated. 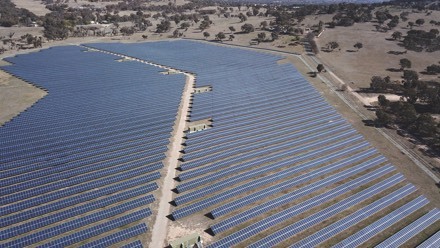 Australia Capital Territory’s premier solar power plant. Capacity 24,500 MWh. Powering 3000+ homes.